President Trump said on Tuesday that he will deploy U.S. troops along the southern border to guard against illegal crossings into the country "until we can have a wall." “Until we can have a wall and proper security, we are going to be guarding our border with the military. That's a big step,” Trump told reporters at the White House while sitting nearby Defense Secretary James Mattis. Trump's comments follow several comments he's made about a "huge caravan" of Central American immigrants traveling through Mexico unobstructed by local authorities until the Mexican government announced late Monday night that the caravan would be broken up. "If it reaches our border, our laws are so weak and so pathetic...it's like we have no border,” Trump said. 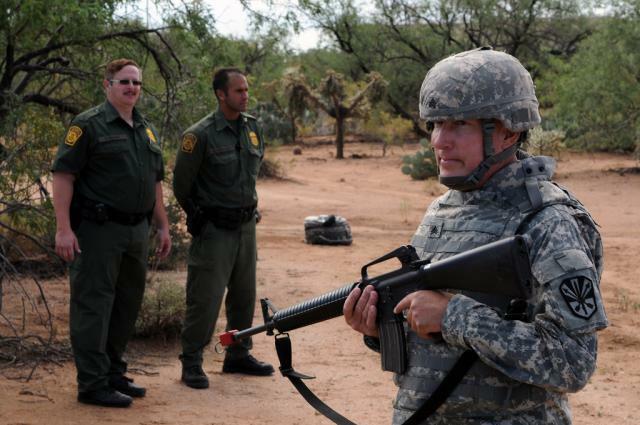 Trump's comments mark a significant escalation in U.S. border policy, as troops along the frontier with Mexico - not the U.S. border patrol, would be the most aggressive action taken to date by the President who promised voters a giant wall. The President closed the door on a DACA deal over the past several days - an Obama-era program designed to protect young immigrants brought here illegally to the United States as children. In a Sunday tweet, Trump railed against "ridiculous liberal (Democratic) laws" like "catch and release". 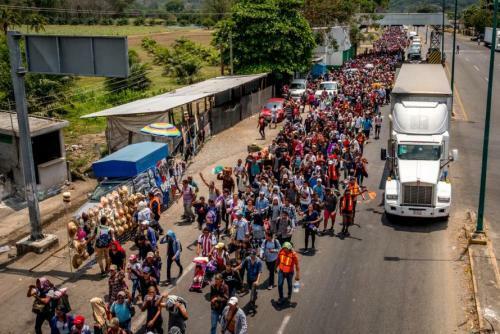 And with more "dangerous caravans coming" to the US border, "Republicans must go to Nuclear Option to pass tough laws NOW. NO MORE DACA DEAL!" Trump left the door open to a 2.5 year extension of the DACA program as long as it included $25 billion to fund the border wall, however Democrats wouldn't bite, instead insisting on a pathway to citizenship for the larger population of 1.8 million "dreamers." Meanwhile, Trump floated the possibility of pulling out of NAFTA if Mexico doesn't take steps to curb the flow of illegal immigrants flowing into the United States. In response to Trump sending troops to the border, former Mexican president Vicente Fox lashed out over Twitter, tweeting ". @realDonaldTrump to militarize the southern border is to provoke more hate and distance even further our nations. Somebody has to talk some sense into him, he's elevating his hate towards Mexico causing a greater conflict."
. @realDonaldTrump to militarize the southern border is to provoke more hate and distance even further our nations. Somebody has to talk some sense into him, he's elevating his hate towards Mexico causing a greater conflict.
.@realDonaldTrump are you really willing to cut every tie between nations just because you didn't get away with yours? Our nations are not only neighbor, we're friends and partners. Yesterday, the former Mexican president ripped Trump for "acting like a spoiled child" over his "DACA is dead" comments. Fox then told Trump that NAFTA "is a "win-win" scenario, which has made not only Mexico but the U.S. and Canada, the most thriving region in the world."
. @realDonaldTrump, aren't you debriefed every day? NAFTA is a win-win scenario, which has made not only Mexico but the U.S. and Canada, the most thriving region in the world. The U.S. has a deficit with almost every country, mainly because you import more than you export. Deploying troops to the border is not an unprecedented move. Both Obama and George W. Bush used the National Guard to help with illegal immigration - however the moves were both temporary. "The United States is not going to militarize the southern border," said Bush when announcing the deployment in 2006. "Mexico is our neighbor, and our friend." Let's see if our friend can stop a horde of Guatamalan "refugees" making a run for the border.